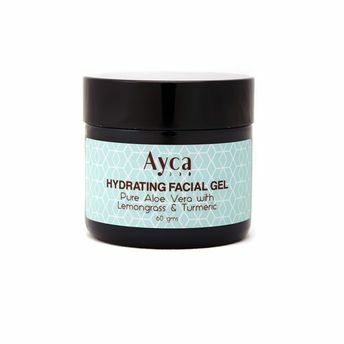 Ayca Lemongrass & Turmeric Hydrating Facial Gel is a non-sticky, soothing facial gel made from pure aloe vera which leaves the skin feeling firm and hydrated. It is enriched with Turmeric and essential oil of Lemongrass which is suitable for Normal to Oily skin types. Pure Aloe Vera with a cellulose-derived gelling agent and essential oil of Lemongrass and root oil of Turmeric.